Back in 1749, he had bought Chopp’d Straw Hall in Twickenham, a higgledy-piggledy, ‘gingerbread’ house whose quirkiness he wanted to retain. Palladian symmetry did not interest him; what he wanted was mystery and surprise. He set about creating a ‘Gothick’ building, full of irregularities and filled with ‘gloomth’, a word he coined for the Gothic-like effect he sought. Walpole took his inspiration from a variety of places. For example, the staircase going up from the hall to the first floor, is based on the library staircase in Rouen Cathedral; the pierced Gothic arches in the library echo the side door of the choir in old St Paul’s. The chimney piece in the Holbein Chamber was inspired by the tomb of Archbishop Warham in Canterbury Cathedral. You can see that the Gothic arch over what is now the grate is where the Archbishop’s coffin would have rested, whilst the rectangular structure bordered by Gothic tracery immediately above, would have held the archbishop’s effigy. A three storey tower, with empty niches for statues of saints, stood on either side of the chimney piece. It’s a very neat adaptation, with more than a touch of chutzpah. However, times change, and, in 1842, all the contents of Strawberry Hill were auctioned off and dispersed in all directions. 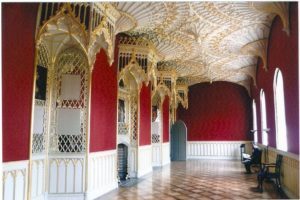 Eventually, in 2007, the Strawberry Hill Trust took over and, in 2010, after years of neglect, the house was restored to its original Gothic splendour at a cost of nine million pounds and I visited it back in 2011 – but more of that in a moment. Much more recently, the Strawberry Hill Trust tracked down some 400 of the 4000 original objects sold and persuaded their owners to lend them for the Lost Treasures of Strawberry Hill exhibition which restored them in their original positions in the house, and I returned to Strawberry House to see it. Unfortunately, photography was not allowed inside the house during the exhibition, so I am using the photographs I took when I visited the house in 2011, when the rooms were, of course, empty. Actually, it’s probably just as well, because the curators also recreated the ‘gloomth’ Walpole wanted and the rooms were all bathed in a sort of sepulchral twilight. I heard a number of visitors saying plaintively, ‘Where are we?’ and trying to read the exhibition’s booklet by the uncertain light from the stained glass windows. Back in 2011, the pièce de résistance for me was the Gallery with its crimson damask walls and splendid ceiling, a miracle of papier-maché fan vaulting in white with gold leaf which almost blinds the eye. When I first saw the white and gold fan vaulting of the ceiling – based on Henry VII’s chapel in Westminster Abbey – I actually gasped. Everything had been specially designed to add to the room’s ambience. 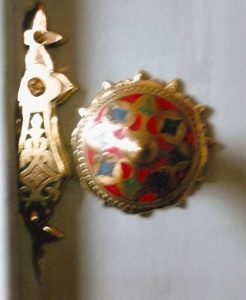 I just loved the brass door knobs with enamel inlay, for example. During the exhibition, however, the Gallery looked quite different. The pictures had been returned to their original places and the room looked smaller, an effect enhanced by the long red benches with arms in between the arches which made it look narrower, too. 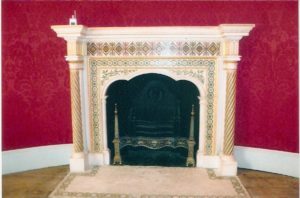 In 2011, I was very taken by the fireplace in the Round Drawing Room with its beautiful scagliola inlay – plaster work of Italian origin designed to imitate different kinds of stone. It was good to see it again. Seeing the house during the exhibition with many of the pictures and ornaments returned, one could get a better idea of how it must have struck its first visitors. Somehow, it managed to be both over the top and elegant but in a slightly decadent way. The contents shown in the exhibition were as extraordinary as the house itself. 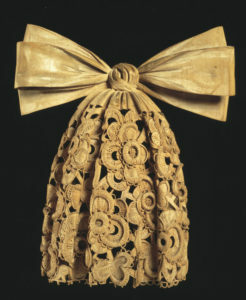 Take this limewood cravat by the wood-carver Grinling Gibbons (1648-1720).Walpole actually wore it. In one of his chatty letters to his friend, George Montagu, in 1769, he wrote: At the gates of the castle I received (his French visitors) dressed in the cravat of Gibbons’ carving, and a pair of gloves embroidered up to the elbows that had belonged to James I. The limewood cravat must have been excruciatingly uncomfortable to wear. Both the cravat and James I’s gloves were returned for the exhibition. Heaven knows what his guests thought of their host’s costume. Walpole was obviously interested in collecting objects which had once belonged to someone important, like Queen Bertha’s comb. Bertha was the Christian daughter of King Haribert of the Franks who married King Ethelbert of Kent; it was through her that St Augustine came to Canterbury and converted Ethelbert, and Kent, to Christianity. 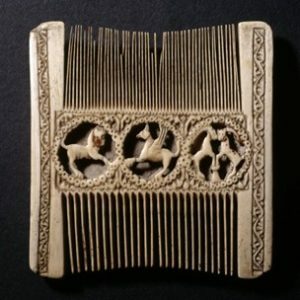 One has to ask, was the comb, borrowed from the British Museum, really Queen Bertha’s? It is obviously a high status object, made of ivory and intricately carved, but it has been dated to the 12th century, and Bertha died sometime before 616 AD. However, there was also Cardinal Wolsey’s red felt and silk hat, borrowed from Christ Church, Oxford, and once belonging to Horace Walpole, also on display. It looked to me suspiciously pristine, considering that it was supposed to be well over 400 years old. 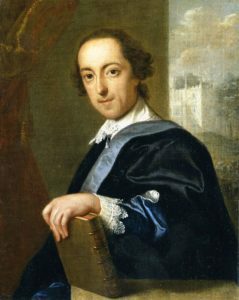 Horace Walpole also wrote the first Gothic novel, The Castle of Otranto, in 1765. It was an immediate success and has been in print ever since. Walpole himself said of it, ‘I gave rein to my imagination; visions and passion choked me.’ The story opens with a huge, black-plumed helmet crashing down and killing Conrad, son of the tyrant, Manfred of Otranto, on his wedding day. Not unnaturally, the bride, Isabella, is terrified and attempts a mid-night escape through a gloomy vault. The story is full of ghosts, a statue which pours blood, prophecies, torments and a spooky forest cave. All splendid stuff and, looking round his house, it was plain that Walpole’s imagination didn’t stop there. Now is a good time to visit Strawberry Hill because, now the Lost Treasures of Strawberry Hill exhibition has closed, some of the objects will remain, like the portraits, digitally reproduced for the exhibition. And the elaborate gold-leafed replica ornamentation over the fireplace in the library will stay – the original, now elsewhere, was too fragile to travel. 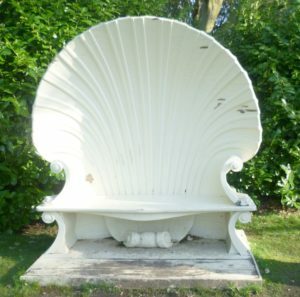 In the garden, there is a replica of Walpole’s original scallop shell seat. What a magnificent place, and what extraordinary objects! I had heard of Strawberry Hill, but had no idea it was so wonderfully over the top and elegant, as you put it, but with that hint of decadence. And as for the Grinling Gibbons cravat, the mind boggles! Thank you, Elizabeth, for this excellent introduction. Strawberry Hill is now top of my list! Thank you, Eleanor. 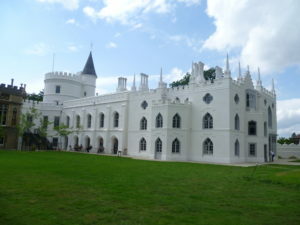 I delighted you enjoyed my post.I think Strawberry Hill would be right up your street. It’s strange the way Walpole’s so keen on acquiring objects that once belonged to someone famous. It reminds me of Napoleon’s toothbrush in the Wellcome Collection! I love this style! 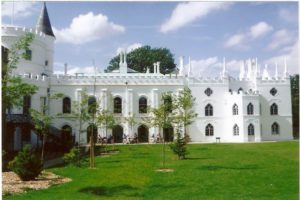 My new book is set in a Strawberry Hill lodge based on this one at Frampton: http://www.framptoncourtestate.co.uk/orangery.htm (though I’d actually conceived it before I found this existed. I made them stop the car, saying ‘that’s the lodge in my book!’). The whole premise is that the heroine is lured on a holiday here purely because the house is so beautiful, so it had to be good. Thank you for introducing me to Frampton Court, Jane. It has everything a writer could ask for: a beautiful building which is not too large, water with waterlilies, wonderful gardens, etc. A picturesque figure like Horace Walpole would probably help, too. I’m sure that he constantly came up with the unexpected. Any writer worth his or her salt could do a lot with that! I’m glad you enjoyed my post.